Summer is the time for family and school reunions. Rhonda Ferree, Horticulture Educator with University of Illinois Extension, suggests taking reunions to another level by starting a reunion garden. "School reunion gardens are especially nice to do using flowers in your school colors." "You've probably noticed that school colors typically include bright, complementary colors." "This also works to create dramatic gardens." Let's use University of Illinois's orange and blue colors as an example. Flowers are often most vibrant when placed with their complementary color. On a color wheel, orange is the complementary color of blue. Complimentary colors create great contrast and cause both colors to pop. Color intensity is also a factor. Bright orange works better with bright blue instead of soft blue. Many annual flowers come in blue. For early spring color use a pansy in deep purple with an orange eye. Other purple annuals include petunia, verbena, gomphrena, ageratum, and statice. 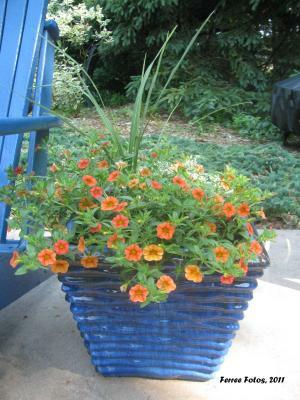 For orange annuals try marigolds, gaillardia, gerbera, nasturtium, or zinnia. Perennial flowers in blue-purple include lavender, amsonia, bellflower, bachelor's button, coneflower, salvia, balloon flower, Russian sage, sage, iris, false indigo, and many more. Consider Illini-colored vines for vertical interest. Clematis, wisteria, and passion flower come in many shades of blue. Orange options include black-eyed Susan vine, native honeysuckles, and trumpet vines. Obviously, there are many more options than Rhonda's listed here. "I could easily add flowering shrubs such as orange or purple flowering azalea." "And, don't forget foliage colors such as blue hosta and gold flame spirea with red-orange spring and fall leaves." Make it simple and choose the right plant for the right place. Rhonda has blue and orange scattered about her gardens. She especially enjoys her deep blue ceramic pots planted with a green spike for height and orange calibrachoa for the container's fillers and spillers. For more information on this or other horticultural issues, contact your local Extension office by visiting www.extension.illinois.edu.